Breitbart News reported in early 2015 that the 13,500 International Longshore and Warehouse Union (ILWU) workers adopting a crane operator “work slow-down” strategy at 29 West Coast ports cost shippers and their customers an estimated $1 billion per day. Facing loses approaching $2 billion a day, the Pacific Maritime Association (PMA) employers finally suspended port work, and the union then went on strike. The bitter four-month labor dispute was settled in February 2015 with enhancements for ILWU workers who were already the most lucrative paid blue-collar workers in America. Settlement meant compensation for full-time union labor, at about $142,000 in wages and $82,000 in benefits. ILWU “clerks” working 50 hours per week could earn over $200,000, and “walking bosses,” equivalent to foremen, could earn over $300,000. But the port strike’s damage lasted for another sic months. California’s fresh fruit and vegetables producers continued suffering 20 percent spoilage, due to eight week export delays. Sun Pacific Shippers and Farming, the largest navel orange and kiwi grower in California, lost half of its yearly exports. Bay Area high-rise office construction ground to a halt due to protracted delays for delivery of imported tempered exterior glass. 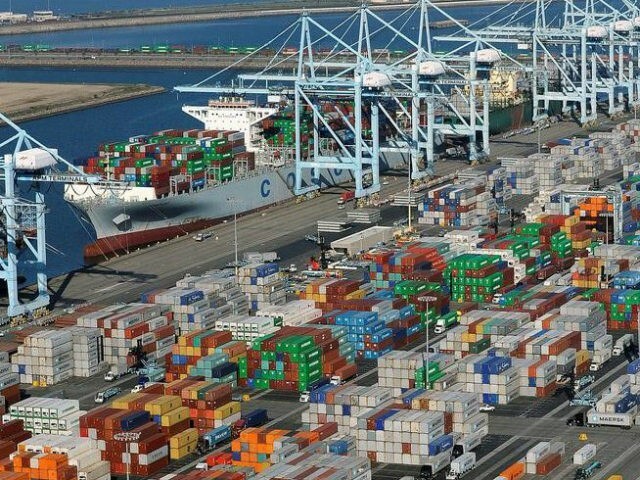 Over the last two years, the PMA has begun the process of automating away port labor and drivers at one of its 22 docks at the Port of Long Beach. Justified as an environmental mediation to fight climate change, the Long Beach Container Terminal Pier E, which opened in April 2016, cut ILWU labor by 66 percent with autonomous (self-driving) electric chassis that receive and deliver cargo containers to other docks and warehouses. The PMA claim it is responding to Southern California Air Quality Control Districts, whose regulations demand that diesel trucks, reportedly the worst greenhouse gas emitters, be replaced by zero emission vehicles. Due to the Clean Air Action Plan, developed between the PMA and the AQMD in 2005, the Long Beach Container Terminal now emits 84 percent less in greenhouse gases, including 33 percent less CO2 and 58 percent less smog nitrogen oxide than in 2005. Asked about losing half of West Coast union jobs to automation since 1960, Herrera claimed the union negotiated contracts, so the remaining union members would receive more pay and enhanced pensions.